Let's just jump right into the deep end of the pool and tackle a topic that produces fevered debate and deeply emotional responses: Is it possible to consume animal protein and still lay claim to a modicum of concern for animal welfare? I don't propose to answer that question, merely to explore the opportunities in our current social construct to make the attempt. Going straight to the elephant in the room -- yes, without question, the inherently humane course that avoids harm to animals is vegetarianism, or even more strictly, veganism. But going back thousands of years to our hunter-gatherer forbears, it can be argued that homo sapiens, like many other species, is inherently genetically designed, by dentition and digestion and desire, to be an omnivore. Early man, and primitive tribes throughout history, had a complex and intimate relationship with the animals they hunted for food, a compact as it were: The animal laid down its life for the benefit of the hunter and his family and tribe, and in return the community honored the animal for its sacrifice, saluted its spirit, and pledged to use every bit of it to sustain and enrich their existence. Needless to say, in our overpopulated, mechanized, industrial society, such an arrangement is no longer even remotely feasible. So for those of us who are deeply appreciative of, and concerned for, our fellow species on the planet, but are still desirous of remaining omnivores, there is a profound dilemma to be faced. Short of retreating from society and living in the wilderness, living on forage and what we can hunt with a spear or bow and arrow, how do we remain omnivores and still respect our fellow creatures? There is no tidy and facile answer. But I would suggest that the place to begin is in the marketplace, where it is now possible to educate ourselves about husbandry practices and subsequently to support those farmers who have shown themselves to be concerned with the physical and mental and, yes, even spiritual health of the animals they raise. 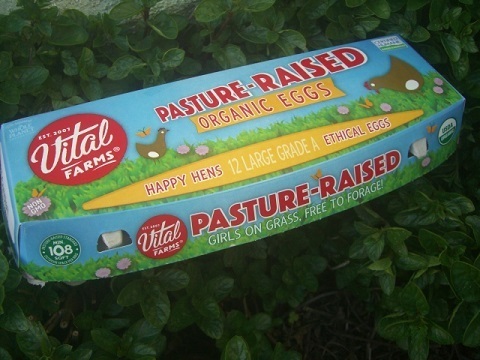 Key words: "pastured" (or "pasture-raised") and "humane certified." "Free range," "cage-free," "natural" -- these designations are meaningless and deceptive. Poultry and livestock that have been permitted to live their lives on pastured land, free to engage in natural behaviors and treated respectfully, are infinitely preferable to factory-farmed creatures that live crowded, unnatural, unpleasant lives. You'll have to do your homework, and you'll pay more -- but worth it, don't you agree? Get as close to the source as you can. If you're in a rural area, locate and get to know your local farmers who follow humane guidelines. In urban areas, it's the farmers markets and Mom-and-Pop health food stores that will allow you to ask questions and learn about the origins of your foods. And even in big cities and large supermarkets, there are tools available -- organizations that do the research for you and certify for carefully-designated and verified humane practices. "Animal Welfare Approved" is one of the most respected and stringent certifications; look for their blue and green seal, which is given only to family-owned farms, never to commercial operations. And seek out the 5-Step Program of the Global Animal Partnership, which offers a rating from 1 to 5 for the level of humane husbandry involved; this system is especially visible at Whole Foods Markets, and is an incredibly useful tool. Studies have indicated that animals raised humanely, on pasture with natural forage, may be arguably more nutritious, vitamin-rich and safer than their industrially-produced brethren. One thing that is inarguable, though, is that in supporting the farmers who strive to respect the animals they raise, we can feel that we are doing our small best to improve the quality of life in an often heedless and heartless world. Change begins with awareness and baby steps; let's start walking. This fresh-tasting quick-to-prepare dish makes a perfect weeknight supper... and be sure to buy chickens with a "5" rating, like Mary's California Bronze. Make gremolata: combine parsley, chives, orange zest, pepper and salt in a small bowl, set aside. 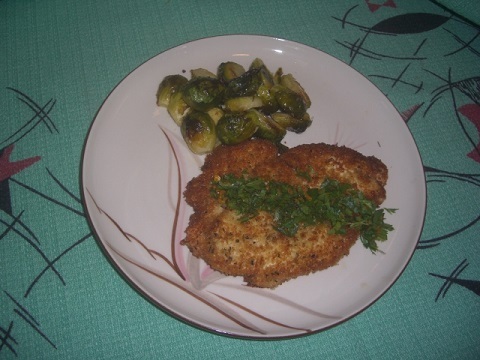 One at a time, dredge chicken breasts in flour, then in egg, then press into bread crumbs to coat evenly. Heat oil in a large skillet over medium-high heat. Cook chicken breasts two at a time, about 3 minutes per side, until golden and cooked through. After removing from pan, squeeze a little lemon over each and salt to taste, and keep warm. Place chicken breasts on a platter or individual plates, scatter a tablespoon of the gremolata over each, and serve immediately. These elegant canapes are always a huge hit at winter-time cocktail parties.. and make sure you source humanely -- Niman Ranch online is a good choice. Place cracked peppercorns on a flat plate and roll & press filet pieces in it. Heat olive oil in a heavy skillet over medium-high heat. Sear peppered filet on all sides for about 3-4 minutes total, so outside is seared and inside is rare. Let it sit for at least 15 minutes. Slice filet against the grain into small thin pieces. Lay out each piece, dribble on a drop or two of truffle oil, sprinkle a few grains of salt, lay on two leaves of arugula and one shaving of cheese; roll in both sides and secure with a toothpick. Repeat with all pieces. If not serving immediately, refrigerate until ready to serve.